It's Faith versus Faith when her doppelganger magically appears and not even Archer can tell them apart. The action picks up where the last issue ended and the race to find the dangerous mouse cosplayer across comic con is the difference between life and death. Part two of two is a fast paced adventure that finds Faith at her best (both Faiths actually). 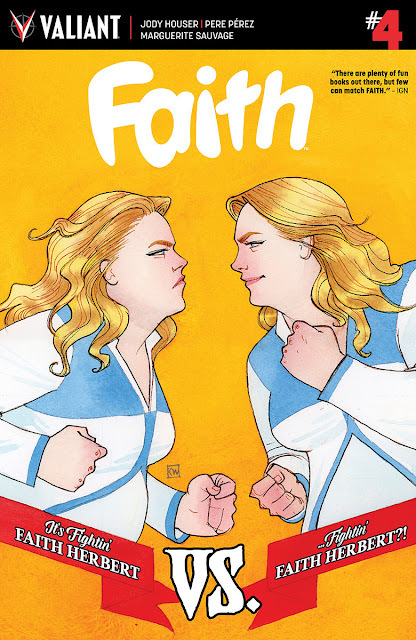 Jody Houser once again uses this opportunity to try and define what makes Faith, Faith. Her double isn't an evil twin but a duplicate and they join forces along with Archer to hunt down the criminal in the mouse suit who's harboring a magical artifact that could prove deadly. Houser's Faith loves being a superhero and it's something she always wanted to be. She even entertains the advantages of having a duplicate to share her life with. Faith is a thoughtful and imaginative person. It's what makes her so relatable and fun. Her thoughts are so beautifully illustrated by Marguerite Sauvage. I can't think of another comic where the flashbacks and daydreams are so vital to the story. It's part of Faith's id and we get to know her in ways you wouldn't with mainstream superheroes. What started as a lighthearted romp in the last issue evolves into a high-stakes clash between our heroes and an army of mouse clones. The Faiths and Archer demonstrate the type of heroism that is selfless and unyielding. They're easy to root for because they're infectiously positive and fearless. Pere Perez and Andrew Dalhouse handle the art outside of Sauvage's work and they create a clean, sharp, and expressive layout of both exciting action and funny smaller moments. Dave Sharpe's lettering is so dynamic in handling both Faiths and of course the clever and cool "con tips" strewn throughout the issue. 'Faith' continues to exemplify the best in superhero comics and issue four is another example of how necessary Faith Herbert is. She's a relatable, lovable, nerd who's also a fierce defender of justice. No pull list is complete without 'Faith' on it.